From the incredible display at Mason Park to shining Christmas trees decorating each home on 6th Ave and wreaths lining the streets of downtown and on to our favorite display of all, the official city Christmas tree in Pinehurst Park, we celebrate our favorite season like no one else! 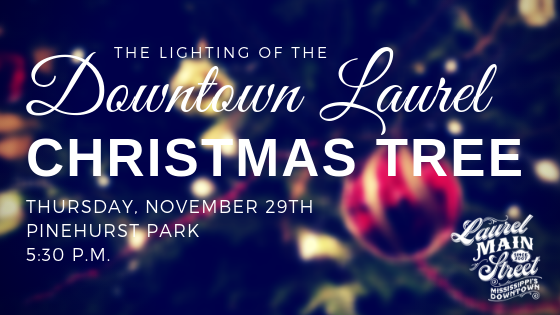 But nothing says Christmas in Laurel more than the official lighting of that cherished tree, and we’d love to have you celebrate this special occasion with us. The tree lighting falls on the Thursday before the first Saturday of December and features local choirs, dancers and children’s choirs. 5:30p.m. Pinehurst Park, 5th Ave. across from City Hall in downtown Laurel. Every year thousands flock to Mississippi’s largest Christmas parade, held right here in Downtown Laurel, MS on the first Saturday of December. It just wouldn’t be Christmas in Laurel without the annual Kiwanis Pancake Day! Held every year in conjunction with the Sertoma Christmas Parade, Pancake Day is the perfect opportunity to enjoy a fun meal with family and friends before or after the parade while supporting the future of local students. The Lauren Rogers Museum of Art Gala, held the first Saturday evening of December, is arguably the area’s most elegant and anticipated event of the year. December Downtown: Bring on the FUN!